For those who have remained Iranian. For those who still give a damn. Monday, December 6th 2004 (16th of Azar), marks the 25th anniversary of the assassination of Shahryar Shafigh. Around one oâ€™clock in the afternoon, December 7th 1979, Shahryar Shafigh, an officer in the Imperial Iranian Navy, was shot twice and murdered as he was leaving his mother (Princess Ashraf Pahlavi)â€™s Paris flat. The two bullets that hit his neck and head were discharged from a 9 mm handgun, fired by a hit man riding a motorcycle, between 25 and 30 years of age, who fled the scene after committing the ghastly murder. Last edited by Liberator on Sun May 22, 2005 12:38 pm, edited 1 time in total. Last edited by Liberator on Sat May 21, 2005 4:01 pm, edited 1 time in total. Ahura Bless his great spirit. He was a great patriot, opposition member & a valuable comrade. What this opposition needed today was someone with Balls & Guts like Sharyar. Unfortunatly People of Gigantic Balls are 6 feet under & Ball-Less Pacifists are alive & will be alive until they'll be 100 years old! Do you know how some of the people have a certain glow on their face? How they shine through? How you feel so warm in their company? How you feel their honesty in your veins? Hoveyda had this quality. This man, this soldier of Iran, Shahryar, also had this shine. His whole face would shine when speaking of Iran! I have the highest respect for this man. And I use present tense because I do not believe that he is dead. I refuse to believe he is dead. He is alive in our hearts. His courage will burn our soul forever. In the futre, his sacrifice & Death Anniversary will be remembered in the Iranian Calendar. Shahryar, with tears in my eyes, I promise we will follow the path. is duplication of this same thread. You have repeated yourself in two different threads. Your new thread could be posted as a reply to this thread. Is there a reason you made a new thread on the same subject? I don't know if you are aware or not (the Tude article is in Farsi), but The historical day of 16 Azar which Tudeh Communist Party wrote about it in their article, has nothing to do with 16 Azar which Hamrazm Shafigh was assasinated! These are 2 different events with only common factor is that they both occured on 16 Azar. There is no connection between the two dates. Are you saluting the memory of Hamrazm Shafigh or are you writing about 16 Azar? Two separate subjects! "They neglect to mention it---because to them, and "republicans" like them, History remains number one enemy--- but the perspective is, interestingly enough, that of those who once chose the above mentioned Mullah Khalkhali as their presidential candidate! " As a nationalist republican, I am deeply offended by this unthoughtful remark or comment. You equaled someone like me to a communist traitor who colaborated with Mullahs? I want to remind you that Republican Hamrazman are making up the great majority of Iranian resistance and Monarchists such as yourself are a small minority. When you make unthoughtful remarks like above, you are insulting the great majority of Iranian resistance. I salute Hamrazm Shafigh. I'm not commenting on 16 Azar because that is another subject and hours worth of debates. I resent a small minority (Monarchists) making insultive comments about the great majority of the Iranian Resistance (Republicans). The article is not written by me and the link is posted on top of the page. This blogger is the only person who I found commemorating Prince Shahryar Shafigh's memory (english page). I've added the article to this old thread so that there are no duplications. The reason the Tudeh article does not mention Prince Shahryar Shafigh is also mentioned in the article by the blogger who says that they do not care mention it because "history is their enemy". I do believe that there are republicans, such as Dr X, who truly believe a republican system is better for Iran - and I respect them for their opinions. 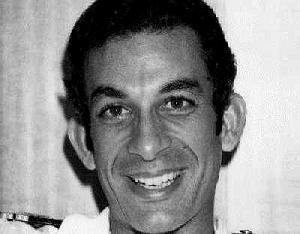 Remembering Prince Shahryar Shafigh on the 26th anniversary of his assassination by the Shiite Taliban. Around one oâ€™clock in the afternoon, on December 7th 1979 (16th of Azar), Shahryar Shafigh, an officer of the Imperial Iranian Navy, was shot twice and murdered while leaving his mother (Princess Ashraf Pahlavi)â€™s Paris flat. The two bullets that hit his neck and head were discharged from a 9 mm handgun fired by a hit man riding a motorcycle, who fled the scene after committing the murder.